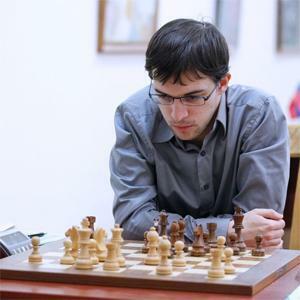 On Thursday, Maxime Vachier-Lagrave drew with Teimour Radjabov but continues to lead the Tashkent Grand Prix after three rounds of play. Sergey Karjakin (vs Dmitry Jakovenko), Shakhriyar Mamedyarov (vs Boris Gelfand) and Baadur Jobava (vs Rustam Kasimdzhanov) won their first games today. Whereas Kasimdzhanov did OK in the previous Grand Prix (he was undefeated and on plus one after round nine, but lost his last two games), his start in Tashkent hasn't been great. The Uzbek GM is playing on home soil, but with a draw and two consecutive losses it might have been more comfortable to be somewhere else. Today the former FIDE world champion (he emerged as the winner of 2004 knockout world championship in Tripoli) went down against Baadur Jobava, who again avoided the main lines — although the Georgian GM hasn't played really off-beat stuff either, lately. Kasimdzhanov's 1.e4 about to be answered by Jobava's 1...e6. | Photo Yulia Monakova courtesy of FIDE. Karjakin's previous Grand Prix was “OK” too (plus one), and with two draws in Tashkent he's been somewhat in the background, but today the Muscovite moved to shared second place with a good win over Jakovenko, one of the other two Russian players. In what looked like a King's Indian Attack, Karjakin's plan of d4, Nb3 and Nc3 was more inspired by the Fianchetto Grünfeld, and it worked out well for White. Jakovenko, who said he hadn't looked at this setup, got a worse ending, which he could have defended better perhaps, but he started missing tactics around move 30 -- and then it was over quickly. A friendly draw between two Russians? No way. | Photo Yulia Monakova courtesy of FIDE. At the end of the day, there was one more winner: Mamedyarov defeated Gelfand — a game that was not decided over the board, but by the clock, as the Azeri GM admitted. Black was absolutely fine out of the opening in a Benoni with an extra tempo. Although White kept the initiative, it was always a draw, even after Mamedyarov sacrificed the exchange, until Gelfand miscalculated in timetrouble. Mamedyarov-Gelfand, the longest game of the round. | Photo Yulia Monakova courtesy of FIDE. The leader of the pack was involved in a heavy theoretical game with Radjabov. “MVL” was again faithful to his Najdorf, and the players bashed out 27(!) moves of theory in about 15 minutes. It's always interesting to see what top GMs have to say about a “main line,” because it should say something about the Najdorf in general, right? Well, the verdict, like in so many openings, is that Black reaches a slightly worse ending that is holdable, but shouldn't be underestimated. Alexei Barsov, Nastja Karlovich, Teimour Radjabov and Maxime Vachier-Lagrave. | Photo Yulia Monakova courtesy of FIDE. Nakamura managed to surprise Giri a few times in the opening, but still the Dutch GM thought he had equalized when he found the plan with ...e5 and ...f6. However, when the maneuver Nf3-e1-d3 was tried at the press conference, the players started to realize that White does have an advantage in the ending. He did too in the game (“I tried to regroup the knights but somehow there was no ideal way of placing them” — Giri) but it just wasn't enough. In the end, the players moved on until stalemate. “What Nimzo variation will I play today...?” | Photo Yulia Monakova courtesy of FIDE. Caruana and Andreikin also split the point in a Berlin Ending where Caruana deviated from his game with Nakamura at the Sinquefield Cup. All minor pieces soon left the board but in the double rook ending White couldn't really achieve anything. Andreikin reaching for his h-pawn on move 10. | Photo Yulia Monakova courtesy of FIDE.